Figure 2. Hypochromic naevus on the chest. Figure 3. Postinflammatory hypopigmentation caused by an allergic reaction to dye in a disposable nappy. Figure 5. 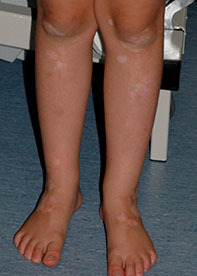 Further examination of the case patient revealed vitiligo on the legs. A 7-year-old girl presents with a small number of hypopigmented macules on her back that have been present for about three months (Figure 1). The macules are well circumscribed and each has a central raised lesion. Hypochromic naevus (naevus depigmentosus). This congenital disorder of pigmentation is relatively common. The lesions are most commonly located on the trunk and are usually solitary, being round or oval in shape with an irregular outline (Figure 2). The pathogenesis is cutaneous mosaicism, in which hypofunctioning melanocytes result in a macular area that is paler than the rest of the skin. The lesions do not fluoresce under Wood’s lamp examination. A hypochromic naevus may be present at birth or become apparent soon after, but in some patients it is not noticed until later in early childhood, and it may extend for some time after being noticed. The lesion is more evident in children with darker skin, whereas in children with lighter skin it may only become apparent after sun exposure when the lesional sites do not darken as much as the surrounding skin. In scenarios where the lesion is extensive, it may follow Blaschko’s lines (reflecting the migratory route of embryonic epidermal cells). Management involves cosmetic camouflage, which can be achieved with make up or a medical tattoo. The lesions will tan and are not severely photosensitive. Postinflammatory hypopigmentation. A variety of inflammatory processes, such as atopic dermatitis, psoriasis, trauma, insect bites, allergic and irritant reactions to exogenous agents and burns, can lead to hypopigmentation through a temporary down-regulation of melanocytic function (Figure 3). The hypopigmentation usually becomes evident after healing has occurred, and its location will correspond with the site of the injury or pattern of inflammation. Under Wood’s lamp, there is evidence of poor delineation of margins. Treatment involves correcting the underlying disorder and then, if possible, exposing the skin to natural sunlight; however, repigmentation can be expected to occur slowly over a number of months even without treatment. Any residual inflammation can be treated with topical corticosteroids to limit further pigment change. Tuberous sclerosus complex. This autosomal-dominant neurocutaneous condition is characterised by multiorgan hamartomatous tumour growth. Seizures, developmental delay and cardiac abnormalities may be apparent in early childhood, but children with milder disease may be asymptomatic. Skin lesions, however, are a feature in nearly all patients. Hypopigmented macules, which start to present from birth onwards, are one of the typical early findings – these tend to be linear to oval in shape and their presence can be confirmed with a Wood’s lamp. 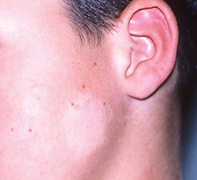 Patients may have more than 50 lesions. Other skin lesions that become more apparent later in childhood include facial angiofibromas, collagenous forehead plaques, and subungual and periungual fibromas. For the 7-year-old girl described above, the onset of lesions is much later than would be expected for tuberous sclerosus complex. Leprosy (Hansen disease). Only 5 to 10% of the population is susceptible to leprosy, an infectious disease caused by Mycobacterium leprae that is transmissible through close and prolonged human–human contact. The diagnosis is made on the basis of typical skin lesions in combination with loss of sensation in a skin patch, enlarged peripheral nerves and positive mycobacterial skin smears. Anaesthetised hypopigmented macules with or without scaling are most likely to occur in the tuberculoid subtype. Leprosy would be highly unlikely in a child who has never left Australia and whose family members are not affected. Pityriasis alba. This is a common paediatric skin condition presenting as scaly, poorly defined hypopigmented patches that do not fluoresce under Wood’s lamp (Figure 4). It most often affects children between the ages of 3 and 16 years, and is more prevalent in males than females.1 The exact aetiology is unknown, but it is thought to be a manifestation of a nonspecific dermatitis in which there is residual postinflammatory hypopigmentation with decreased melanocyte activity. Children with pityriasis alba are not necessarily atopic. When questioned, parents sometimes recall a brief erythematous inflammation prior to hypopigmentation. The lesions are usually irregular, less than 5 cm in diameter and located in the facial region; however, they can affect the trunk and limbs (much less commonly), and can be much larger in these locations. Pityriasis alba is much more easily seen in children with darker skin; it may not be noticed when it occurs in fair children. Vitiligo. This is a common, acquired autoimmune skin depigmenting disorder in genetically susceptible individuals. Loss of melanocytes from the epidermis is complete, and so examination with a Wood’s lamp produces fluorescence. This complete loss of pigment differentiates vitiligo from other depigmenting conditions, in which melanocytes are still present. Vitiligo is characterised by very well-defined ivory macules that burn easily in the sun. The lesions can affect any part of the body but are most common on extensor surfaces, the eyelids and lips. Disease progression is variable – there may be long periods of remission, but it can also extend rapidly in short periods. A large number of cases commence in childhood. However, the appearance of a centralised naevus within a depigmented macule is not typical, so it is an unlikely diagnosis for the lesions shown in Figure 1. Halo naevus (Sutton naevus). This is the correct diagnosis. Halo naevus occurs in up to 5% of the population, most commonly in children and adolescents between the ages of 5 and 16 years.2 A single lesion is most common, but multiple lesions also occur.2 A halo naevus is characterised by a pre-existing central melanocytic naevus that develops a symmetrical halo of depigmented skin. It typically involves common acquired naevi, but it is also associated with blue naevi, congenital naevi, melanomas and Spitz naevi. The involved naevi tend to be small, less than 1 cm. Once the halo has developed, the natural history is for complete regression of the naevus, leaving a well circumscribed macular patch of skin with decreased pigmentation that may not return to normal skin colour. The naevus is usually located on the trunk, most commonly on the back. The incidence of halo naevus is higher in patients who have a personal history or family history of vitiligo, and the two conditions may occur together.3 For this reason, the pathogenesis of halo naevus is thought to be similar to that of vitiligo (involving autoimmune destruction of melanocytes). However, there is additional autoimmune destruction of the naevus cells is involved in a halo naevus.4 In the patient described above, vitiligo was revealed on the lower limbs when a full skin examination was conducted (Figure 5). There is a potential concern of melanoma in a pigmented lesion associated with irregular areas of dyspigmentation, including hypopigmentation. However, when the central lesion is clearly a benign naevus on dermoscopy and the surrounding loss of pigment is symmetrical, a benign halo naevus can be confidently diagnosed. Melanoma is very rare in prepubertal children. A halo naevus is benign but, like any naevus, should be assessed thoroughly for any features of potential concern. A full skin examination should be conducted in a patient with a suspected halo naevus because they often present with multiple halo naevi and sometimes also vitiligo. A biopsy is warranted when a lesion appears atypical and when are any features of potential concern, but in most situations monitoring is sufficient. Referral to a dermatologist would be recommended for a child who has a suspected halo naevus with any suspicious features. Sun protection is required until repigmentation occurs. 1. Leung AK, Feingold M. Pityriasis alba. Am J Dis Child 1986; 140: 379-380. 2. Rivers JK, MacLennan R, Kelly JW, et al. The Eastern Australian Childhood Nevus Study: prevalence of atypical nevi, congenital nevus-like nevi, and other pigmented lesions. J Am Acad Dermatol 1995; 32: 957-963. 3. Patrizi A, Bentivogli M, Raone B, Dondi A, Tabanelli M, Neri I. Association of halo nevus/i and vitiligo in childhood: a retrospective observational study. J Eur Acad Dermatol Venereol 2013; 27: e148-152. 4. Zeff RA, Freitag A, Grin CM, Grant-Kels JM. The immune response in halo nevi. J Am Acad Dermatol 1997; 37: 620-624.